Aqir (also spelled Akir and Akkur) was a Palestinian Arab village in the District of Ramle located 9 km southwest of Ramla and 1 km north of Wadi al-Nasufiyya (today called Nahal Ekron). Until the early 20th century, Aqir was thought to lie at the site of the ancient Philistine city of Ekron, that has now been identified as Tel Mikne, 9 km to the south. The error seems rooted in antiquity; The Romans referred to the village as Accaron. In the 10th century CE, Al-Muqaddasi writes of Aqir (Ekron) as "A large village with a fine mosque. Its inhabitants are much given to good works. The bread here is not to be surpassed for quality. The village lies on the high road from Ar-Ramlah to Makka." Yakut called it Al Akir, and said it belonged to Ar Ramlah. In 1596, Aqir (Amir) appeared in Ottoman tax registers as being in the Nahiya of Ramla of the Liwa of Gaza. It had a population of 31 Muslim households and paid taxes on wheat, barley, and other produce. The scholar Edward Robinson passed by the village in 1838, and described it as being surrounded by "well-tilled gardens and fields of the richest soil". The village itself was described as being of "considerable size", built of bricks or adobe. In the 1870s, Aqir was described as "a mud village on low rising ground, with cactus hedges surrounding its gardens, and a well to the north." At the time of the 1922 census of Palestine, Aqir had a population of 1155 Muslims. This had increased to 1689 Muslims and 2 Christians by the census of 1931. Between 1941 and 1948, the RAF Aqir air base was located nearby. As of 1945 the village had a population of 2,480 with two elementary schools: one for boys, founded in 1921 which had an enrollment of 391 boys in 1945 and a second for girls, which had an enrollment of 46 girls in 1945. There were two mosques in the village. 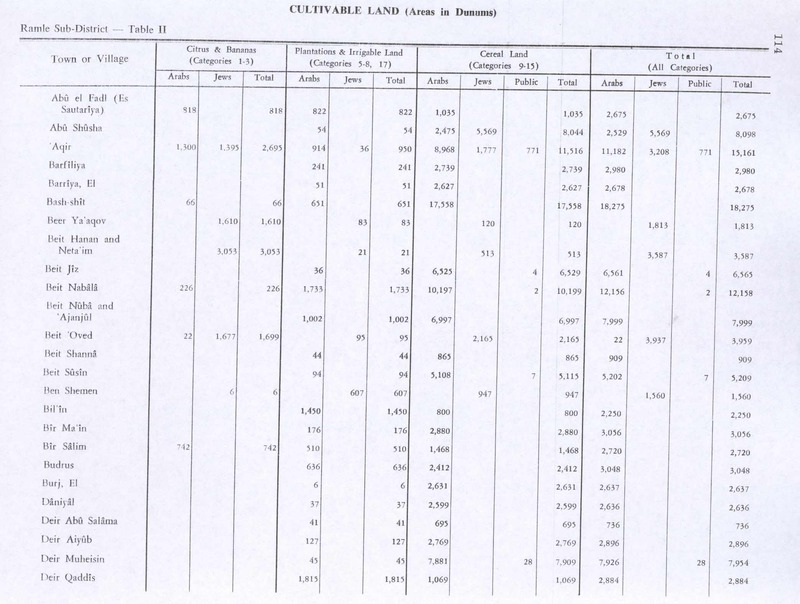 In 1944/45, the village had 1,300 dunums of land used for citrus and banana cultivation, while 8,968 dunums were used for cereals, and 914 dunums irrigated or used for orchards. The village was depopulated during the 1947–1948 Civil War in Mandatory Palestine on May 6, 1948 during Operation Barak by the Giv'ati Brigade. The remaining village houses was taken over by Kiryat Ekron soon after. A number of small houses remain, several of which are occupied by Jewish families. One is a cement house with a gabled roof and rectangular doors and windows, another is similar in its features, but its roof is flat. Cypresses, cycamores and cactuses grow on the site. The surrounding lands are cultivated by Israelis. ^ Morris, 2004, p.xix, village #252. Also gives cause of depopulation. ^ Seymour Gitin and Trude Dothan (1987). "The Rise and Fall of Ekron of the Philistines: Recent Excavations at an Urban Border Site". The Biblical Archaeologist 50 (4): 197–222. doi:10.2307/3210048. JSTOR 3210048. ^ Wolf-Dieter Hütteroth and Kamal Abdulfattah (1977). Historical Geography of Palestine, Transjordan and Southern Syria in the Late 16th Century. Erlanger Geographische Arbeiten, Sonderband 5. Erlangen, Germany: Vorstand der Fränkischen Geographischen Gesellschaft. p. 153. ISBN 9783920405414. http://books.google.com/?id=wqULAAAAIAAJ&q=Historical+Geography+of+Palestine,+Transjordan+and+Southern+Syria+in+the+Late+16th+Century&dq=Historical+Geography+of+Palestine,+Transjordan+and+Southern+Syria+in+the+Late+16th+Century. ^ Robinson, 1841, p21- p.25. Cited in Khalidi, 1992, p. 360. ^ J. B. Barron, ed (1923). 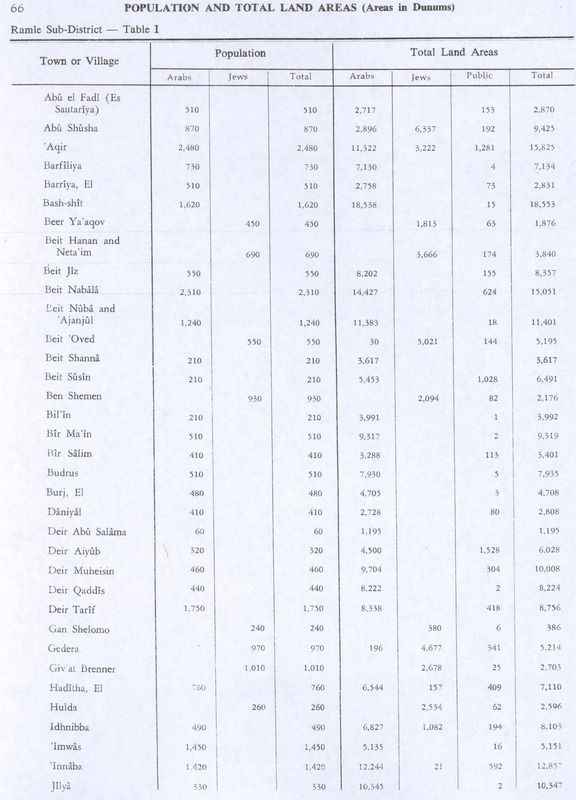 Palestine: Report and General Abstracts of the Census of 1922. Government of Palestine. Table VII. ^ E. Mills, ed (1932). Census of Palestine 1931. Population of Villages, Towns and Administrative Areas. Jerusalem: Government of Palestine. p. 19. ^ "אודות קרית עקרון [About Kiryat Ekron]" (in Hebrew). Kiryat Ekron local council. http://kiryat-ekron.muni.il/index.php?id=45. Retrieved 2010-06-29.